Lower back pain comes in an amazingly disturbing variety of forms, and medical language sure doesn’t make it any easier for your average person to understand at times. Spondylolisthesis, spinal stenosis, cervical disc prolapse and on and on, the medical jargon just keeps on going. Here I’d like to discuss a specific problem that comes up surprisingly often at our office, Living Well Medical in SoHo, NYC. More specifically, dessication and herniation of the L5-S1 intervertebral disc. That way you can learn a little bit about what it is and of course, Living Well is right there to lend a hand if you are hurting. After all, we are on the cutting edge of non-surgical treatment. Where is the L5-S1 disc? The L5-S1 area is the line of demarcation between the lumbar spine (L) and sacral spine, the combined region sometimes being called the lumbosacral spine. The lumbar spine is often associated with the abdominal area while the sacral region correlates to the pelvic/hip area. L5-S1 is right between these spinal regions. What are the symptoms of an L5-S1 disc problem? Although it varies from person to person, there is a generalized group of symptoms, a combination of which is possible. They might include, to name the major ones: burning sensation, tingling, numbness, back pain, leg pain and sciatica. What is different about the L5-S1? The disc in this intervertebral space is one that bears much of the weight of our bodies; it’s one of the major reasons this disc is so prone to damage like herniation. In that sense it isn’t much different than a normal disc other than the stresses it undergoes during a normal human life. 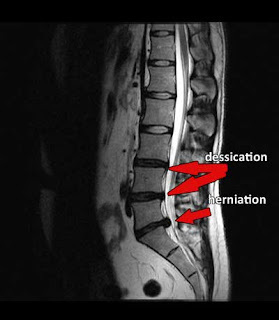 Disc dessication is when a spinal disc loses its fluid and begins to lose height. As the disc dries out from the loss of water and collagen, it becomes brittle. It will also often show as black and thin on an MRI, as is indicated in the photo. Dessication can affect its ability to absorb shock and increase the likelihood of herniation or bulging. Will I have to get surgery for it? This is a common misconception that surgery is the best option for a back problem like herniation. The way I see it is like this: if there’s a chance you can avoid surgery, shouldn’t you? Non-surgical treatments can be just as effective in stopping pain with the right doctors and the right treatment. Surgery doesn’t have to be the only option. Treatment for an L5-S1 disc herniation at Living Well consists of spinal decompression therapy using the DRX9000, chiropractic treatment, Cox Flexion technique, physical therapy massage therapy and ARt (Active Release Technique). By combining multiple complementary techniques, we find that treatment outcomes are often improved. I was so confident in my protocol that I even went and got a patent for it. So that does it for some of the major questions. If something you are curious/worried about hasn’t been covered here, give us a call. We want to help you feel well again. (212) 645-8151.
it's much safer to have a chiropractic treatment for your neck pain or headache then taking medicine (over the counter or prescribed). The pain in the neck and joints is relieved once a patient undergoes a round of Chiropractics. This form of alternative medicine is best suited for people suffering from arthritis as the pain caused restricts movement of patients thus life becomes quite difficult for Arthritis patients. By employing the techniques of Chiropractic arthritis patients have been known to move without much difficulty.